The solar photovoltaic cells are devices used to convert electrical energy into light energy by the photovoltaic effect. The solar photovoltaic wafer is primarily used to create photovoltaic cells. These wafers are made of crystalline silicon cells. The wafer is exposed to high temperature and contains phosphorous oxychloride. The wafer at the top of the solar cells is coated with anti-reflective coatings made of silicon nitride which is used to increase the light absorption capacity by decreasing the reflection. The solar photovoltaic wafer offers durability in comparison to other substitutes accessible in the market. The global solar photovoltaic wafer market is anticipated to expand at a significant CAGR during 2018-2027. It is projected to reach significant market size by 2027. The increasing demand for the electricity coupled with the rising demand for the renewable energy sources worldwide is anticipated to increase the market growth of the solar photovoltaic wafer market globally throughout the forecast period. The global solar photovoltaic wafer market can be segmented on the basis of material type and region. On the basis of material type, it is sub-segmented into monocrystalline wafer and multicrystalline wafer. Multicrystalline wafer is anticipated to be the fastest growing sub-segment on the account of increasing usage in producing high quantity of electricity. Additionally, the increasing demand for the electricity across the globe is another factor for the rising demand for the multicrystalline solar wafer during the forecast period. The rising demand for the renewable energy across the globe is anticipated to be the major growth driver for the global solar photovoltaic wafer market over the forecast period. The increasing demand for the energy on the account of rising population and increasing industrialization is anticipated to boost the global solar photovoltaic wafer market. 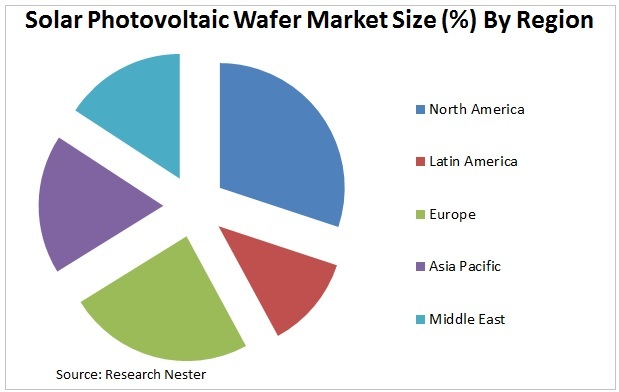 The rising demand for the solar photovoltaic wafer to recharge the electric vehicle is also driving the solar photovoltaic wafer market globally. The various government regulations regarding the use of the fossil fuel are anticipated to support the market growth of the solar photovoltaic wafer. The government is taking initiative such as increasing the capacity of solar power plants across the globe. This indirectly upsurge the demand for the solar photovoltaic wafer. Additionally, increasing demand for solar based energy on the account of technological development in the electronic sector is also driving the solar photovoltaic wafer market across the globe. However, the high cost associated with the solar photovoltaic wafer in comparison to other photovoltaic wafer is anticipated to be a major restraint for the global solar photovoltaic wafer market.